This was one of my most popular recent posts, and it should be, it's delicious ! Part of the fun for me having a blog is having people make my dishes, and make them their own. When someone pinned this recipe, then made a note about putting it on the smoker, I fell in love ! 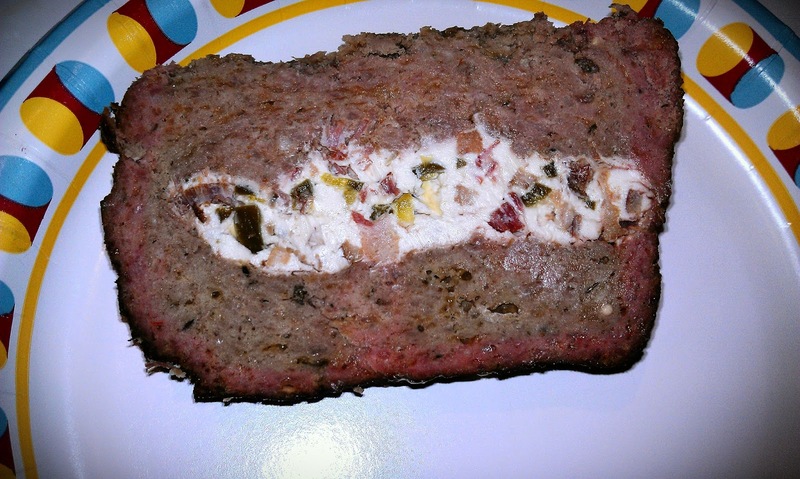 I never thought to smoke a meatloaf. But I had to try it. The smoke made this even better, and it was already one of my favorites ! So here is the original, with additional instructions for smoking. You have to try this, check out the smoke ring on that baby ! Prepare smoker to a steady temperature of 250. In a large bowl, mix together panko bread crumbs and milk. Let the milk absorb completely, then add ground beef, eggs, steak seasoning, Worcestershire sauce, cheese and eggs. Mix well and set aside. In a separate bowl, combine cream cheese, jalapeno peppers and bacon. Using a 9 by 5 loaf pan, press half of the meat mixture into the bottom. Spread cream cheese mixture over the top, then press remaining meat mixture over the top of this. Poke some holes in the bottom and sides of an aluminum hotel pan, and invert the loaf pan into the hotel pan. Place on the smoker and let it go. After 2-3 hours you should be able to easily remove the loaf pan. Let it continue to smoke for 2-3 more hours until you reach an internal temperature of 200 degrees. Let it rest for 30 minutes then slice and eat. It's so pretty !